Ann Haymond Zwinger was born in 1925 in Muncie, Indiana. She attended Wellesley College and graduated with a Bachelor’s Degree in Arts in 1946. Zwinger graduated with a Master’s Degree in Fine Arts from Indiana University in 1950. After enrolling at Harvard to pursue a Ph.D., she “was swept off her feet” by dashing Air Force pilot Herman Zwinger and married him in 1952. As a military wife, she followed his postings throughout the United States. Transferred to Colorado in July 1960, the Zwingers purchased forty acres near Colorado Springs. Ann began to illustrate and catalog all the plants on their property and became interested in alpine ecosystems. In 1969, Ann Zwinger was introduced to Rachel Carson’s literary agent, Marie Rodell, by a mutual friend. Rodell encouraged Zwinger to write about her Colorado home. 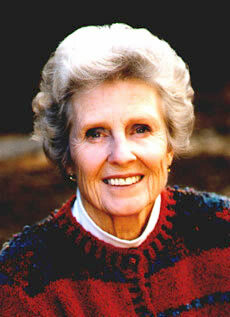 Her writing became her first book, Beyond the Aspen Grove (1970). Zwinger went on to publish twenty more books of natural history, spanning thirty-one years and covering American deserts, alpine tundra, and Baja California, Mexico. Her publications, which often featured her illustrations of flora and fauna, had wide popularity and gained recognition in scientific circles. Zwinger was nominated for a National Book Award in Science in 1973, won the John Burroughs Award for Nature Writing in 1976, the Western Arts Federation Award for non-fiction in 1995, the John Hay Award from the Orion Society in 1996, and the “Spirit of the West” Award from the Mountains and Plains Booksellers Association in 2001. Zwinger wrote for dozens of periodicals, including Audubon, The Smithsonian, Natural History, Islands, Orion, Plateau and Nature Conservancy magazines. Ann Zwinger’s work was often presented in anthologies, including The Illuminated Landscape: A Sierra Nevada Anthology (Sierra College Press, Santa Clara University, Heyday, 2010). Zwinger taught at Colorado College, Carleton College and Smith College. 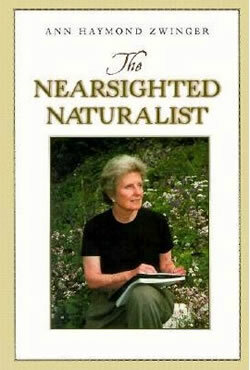 She often spoke at colleges and before environmental groups, and, as her obituary states, “inspiring others to venture into the wild, carefully observe, and write about it.” As a result, Ann was presented with honorary degrees from Colorado College, Carleton College and the University of Colorado. In 1977, Wellesley College awarded her the Alumnae Achievement Award. Ann Haymond Zwinger died in 2014 at the age of 89. Based in part on the obituary of Ann Haymond Zwinger published in the Colorado Springs (Colorado) Gazette on September 7, 2014. - Zwinger: Publicity photo from the Northern Arizona Book Festival, April 2000, event sponsored by Literacy Volunteers of Coconino County, Flagstaff, Arizona.